It's prom night, and up till now Perry Stormaire's only worries were finishing his college applications and getting his band its first big gig in the Big Apple. But when his mother makes him take geeky, quiet Lithuanian exchange student Gobija Zaksauskas to the prom instead, Perry figures the night is going to be a disaster. When Gobi turns out to be a trained assassin on a special mission--five targets by daybreak--Perry's roped into it whether he likes it or not. Now they're off like a prom dress on a reckless, no-brakes blitz through nighttime Manhattan in his father's red Jag, going eyeball-to-eyeball with Russian mobsters and teen angst, high-velocity bullets and high school bullies, all thanks to the most beautiful girl that ever almost got him killed. 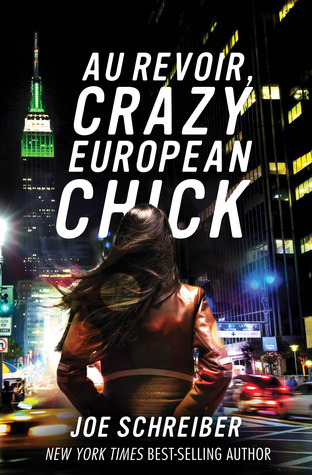 Crammed with car chases, heists, hits, henchmen, eyeliner, and even a bear fight, Au Revoir, Crazy European Chick is a pedal-to-the-floor, rapid-fire thrill ride that will hold you captive to the last page. And remember, it's not over until "au revoir." 1. (+) Perry, the protagonist - Smart kid. Kind of nerdy/has the "virgin" reputation he hates. Plays in a band. Is rather cynical (example: "Human beings are like the screwed-up children of alcoholic parents in that way, picking up the pieces afterward and trying to make up reasons why.") Funny. Believable for the most part... and also brave. A kid who takes his experience from that night and grows from it. 3. (+/-) Situation with Gobi - I'm still not sure I really understand Gobi's situation. And how exactly did she have the means to become a trained assassin in such a short time? And then convince whoever trained her to let her go on a personal mission like that? Unless no one trained her... in which case, again, how did she do that? And also, not sure I'd believe that someone would become a trained assassin because of the reason Gobi tells Perry. Seems like WAY too extreme of a reaction to me. 4. (+) The Writing - Joe Schreiber knows how to capture your attention. He's good at varying the pacing (some chapters were really short!) and also excels in building suspense and mystery. I particularly liked how quick the dialogue went and how it was easily readable, how you knew exactly who was speaking because he made each character have their own distinct way of speaking. 6. (--) Unrealistic - Oh my god. There are so many things in this book that I couldn't deal with. I know, I know, I should've known better, but still the romance... the fact that Gobi didn't just get rid of Perry and that she actually liked him... (Why again? Yes, he was the only nice to her at school, but a trained, 24-year old assassin having feelings for a young high school kid is incredibly creepy.) The fact that so few people seemed to catch on to what was going on... The fact that Gobi's targets didn't hide after the others started to die... Ah, so many more, but I'll stop now. 7. (+) Exactly as Advertised - But I can't completely fault the book for that; I mean it practically tells you how unrealistic it'll be in the summary... and what I probably ought to comment on is whether or not those scenes were done well... Yes, I think they were. Torture methods, fights, questions of trust, guns--Au Revoir, Crazy European Chick is a book that gives you exactly what the summary describes in a well-written way, and it's not often that both of those things happen. If you like the summary, go for the book. If you don't... maybe not. 8. (--) Not a Full Cast of Characters - Perry, Gobi, and Perry's dad are pretty much the only characters somewhat developed, so if you don't like Perry or Gobi (the dad you are guaranteed to dislike), then you probably won't enjoy reading this novel. As much as I liked the repartee between Perry & Gobi, I wished there were also other solid characters to lean on. 10. (+/-) The Cover - the ARC doesn't have a cover, but the image above sort of bothers me. Yeah, the city lights are all blurred like hectic action in the book, and yeah, you can't see Gobi's face, hinting at her mysteriousness.... but that jacket bothers me. Stuffing her hands into her pockets bothers me. It feels more like a cover for someone just discovering the city than for someone who wrecks the city. Au Revoir, Crazy European Chick is the fast-paced ride packed with action which it claims to be; if you enjoy that sort of thing and don't mind the ridiculous bent to the story, go for it. It's a fresh addition to YA contemporary. 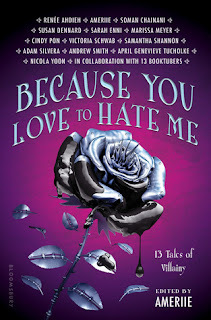 I recently got my first ARC from a blog contest. I was so excited. The book's already come out but it's still nice to actually have one!